Gertie's New Blog for Better Sewing: Leather and Lace Babydoll? Last week, I wrote about my plan to make a girly leather and lace dress for an upcoming performance (of the rock and roll variety). I was tempted by the combination of an updated 50s silhouette with the lace/leather. But I saw this Saint Laurent dress yesterday and have totally been having second thoughts. As you know, I'm in a Swinging Sixties phase. And I know this silhouette works really well for me. And how cute is that leather Peter Pan collar and bowtie? I'm kind of in love! What do you all think of this versus the girlier silhouette, like this Alice and Olivia number? I have to say, I'm leaning toward the babydoll! 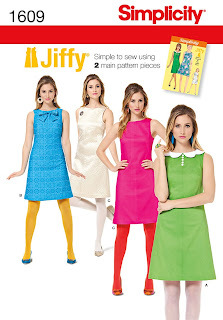 I could easily adapt Simplicity 1609, which is my recent favorite. Could look cute with lace cap sleeves! I think it would look cuter if it was reversed. Leather on top with the leather collar (of course!) and the lace on the bottom. you could even add a leather band at the bottom if you underlined the lace with a slightly stiffer material. A little bit of both worlds. Me three. The lace will float around and be fun and give you the right drape. Not sure "leather" and "babydoll skirt" go hand in hand - the skirt above isn't a trapeze cut like your latest (purple) dress was. Regardless, a quick pair of cute bloomers to go under if you're going to be performing on a raised stage might be in order! Yea on the bloomers--I'm playing drums at some point and won't be sitting like a lady! Actually, I have a pair of longish boyshorts that should work . . . Here's a fourth vote for leather on top! I also agree with leather on top. There's something butcher apron-ish about the leather bottomed babydoll. I lurve the girlier version. Of course, if you don't do it, maybe I will! Completely agree with twirldesigns. Took the words out of my mouth. I vote for the babydoll dress. I would keep it as is though. I really like the contrast of the leather collar against the lace. I think leather collar, leather sleeves, and lace body would be really excellent. I'm in love with the Alice & Olivia dress, but I think that's because I'm used to choosing what goes best with my own body. I have a smallish bust, but a great waist/hips package (little waist, curvy hips), so babydoll dresses tend to play up my least exciting feature and hide my best ones. The fitted waist and floofy skirt would look great on my body type. Based on what you've shared with us, you look great in the girly dresses and in the babydolls. What would you most like to play up at this performance? I'd totally qo with the YSL dress (although without the collar and those weird pouffy sleeves ... ). The A+O dress looks more hipster, and I'm fed up with hipster aesthetics right now. I prefer the 50's silhouette. I find the other dress looks somewhat like a leather apron - and not in a cute way. I really like that YSL dress - sweet and sassy! Plus i think that one will give more of a Courtney Love feel when your playing drums, and paired with your pink hair would look awesome. 90s baby doll all the way! Baby doll dress. Might be easier to sit in when playing the drums too. I love both. Can't decide. You are getting more tattoos. Love it. Very beautiful. I just started my sleeve. Love your hair. I slightly prefer the 50s Alice & Olivia dress, but it could probably go either way. I think the reason is that I'm kind of skeptical of the leather on the lower half of the babydoll dress. Part of what makes that style work is that it's somewhat swingy, and that dress doesn't look like it would move right. If the leather is too stiff, it just sort of looks like you're wearing a chunk of innertube or something, so it's something to be kind of careful with. But if you follow the suggestions of some earlier comments and mix up the leather placement I could see it coming out really awesome! they are both lovely in photo. I think that the full skirt will be better performance wise. It doesn't look at all comfortable, and you will be hot on stage and will be sweating bullets in a leather dress. It might dye your skin like some leather pants have done before. I don't think it will move well either. I vote for a lace dress with leather accents. Either silhouette is fine. I vote against a mostly leather dress due to sweat and dying your body. I think you're going to have to go with the babydoll version. True love cannot be ignored. In leather I'd totally go for the more 50s shilouette. 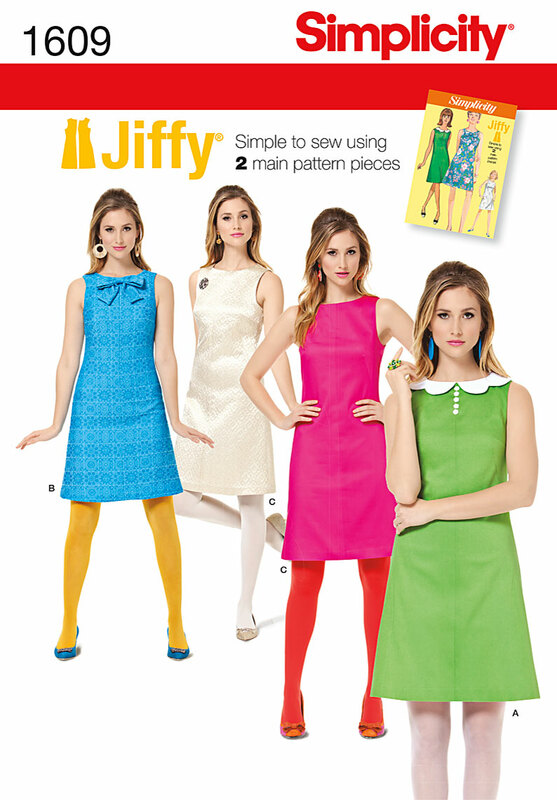 I think the 60s look is adorable (I love simplicity 1609 too!) but I think the leather would leave the dress too stiff. It would give an interesting look to the Alice + Olivia dress though! I think the YSL dress is fantastically cool, but I am not sure how the leather will "swing." I suppose I just think of leather as more sheath than babydoll when it comes to dresses (including the YSL style, just on a very thin model). Love the idea of a leather & lace combo of some sort, but, again, I agree with others who have commented — a lot of leather (fitted or no) on stage is going to be HOT! Or what about converting the YSL concept to separates — a lace top with leather accents, and then short leather shorts. Not your usual style, I know, but leather & lace and great for the stage (including drums), and you totally have the legs to pull it off! That ensemble would be hot hot hot in all the right ways! I like you in V-necks, best. But I agree with Twirldesigns, that leather should be up top, lace layers on the skirt, and boyshorts. It will still remind us of 90's grunge. Rock it out, girl! Honesty could be the ideal plan when it really is time for you to speak dollars. "If you are on the stringent spending budget, inform your advisor up entrance," advises Allen. "Then we are able to allow you to come across a terrific Chiffon A-line Sweetheart Sleeveless With Applique Floor-length Wedding Dress in that price tag variety." You are only location your self up for heartache should you attempt on wedding dresses that you just can not pay for. "Everything soon after that may be like evaluating a RollsRoyce to some Kia," suggests Allen. "It will travel you nuts." Definitely the original plan, Gertie! It's edgier. I disagree with putting the lace on the skirt--to echo others, leather is hot; when you're performing (I'm a singer), you want the cooler fabric on the bodice. Also, although the lace would drape more for the skirt, it seems like the leather would stand away from the body more, emphasizing that cool baby doll look. How about both? I personally love the first one you showed us yesterday, but it seems you would have fun with either. I kind of like the baby doll but I find that because the lace is shear and you can see the skin underneath it looks like you breasts are chopped, so I think a dark gray fabric underneath would solve that, I think the second one is more forgiving in therms of it s silhouette but honestly you can make both since they are different shapes. i love baby doll look!it looks more cute....leather & lace is today's hottest trend.Recently i bought leather & lace peplum top & it looks more adorable...i think you should try for leather & lace peplum top or leather& lace with floral print...this combination looks more pretty.like your blog. 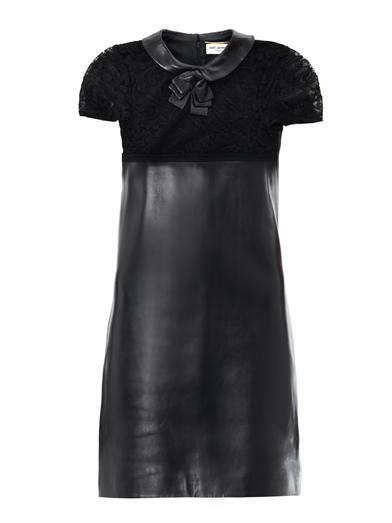 If you are going for a girly combination of leather and lace than I would definitely go for the skater silhouette over the baby doll. This particular baby doll dress looks more punk rock/goth. 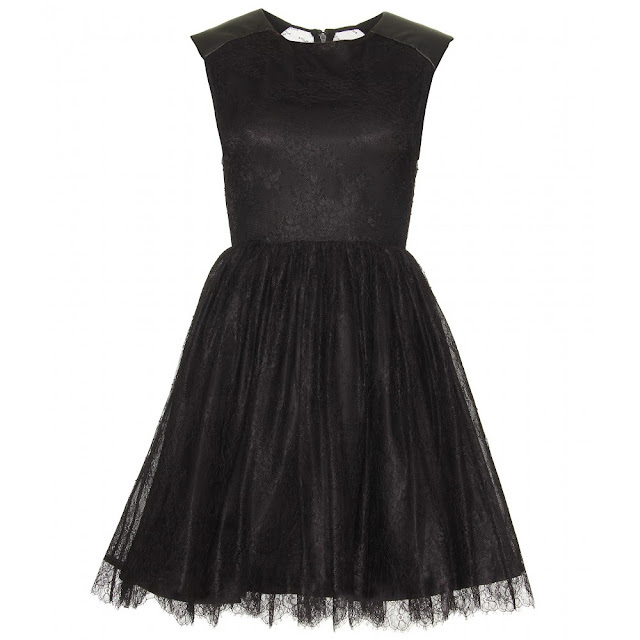 And if you made a short or mini skater dress, it would definitely look '60s. I personally think it would look even edgier than the baby doll, the combination of silhouette and material is more unexpected. If you honestly cannot decide, you may want to take into consideration which style would be the most practical. Which would be the most affordable, fit the event, keep you comfortable, most likely for you to wear again, etc. Have you seen the price of the YSL version? Nearly 5000$!!! So you save so much making your own version. It's gorgeous btw, but too young for me. I prefer the girlier silhouette. The baby doll dress looks a bit like Dexter's leather apron to me, and I can't imagine trying to play drums in a slimmer silhouette like that. The baby doll go for it! although I must admit I'd be tempted to make both! Girlier version for sure! It'll save you money on leather and the awkward sound of leather on hard surfaces. Ew. I love the YSL dress...I have not stopped in to read your blog for a long time, you look adorable with your new bob hairdo!! I love the leather and lace Saint Laurent look. You could split the baby doll into a top and a skort (skirt on the front, shorts in the back). That way you can capture the babydoll look and can still play the drums. love the Saint Laurent look but both are cute! I'm having a hard time imagining how these dresses will look with your tattoos. I think they often interfere with the lines of the garments, and not always in a good way.